In the charming northeast corner of Mauritius, 1 minute from the beach of Trou aux Biches, Le Palmiste Resort & Spa is located in a beautiful exotic garden. 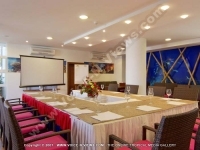 Its 18 air conditioned bungalows and the main building are grouped around a pool area with an adjoining bar. 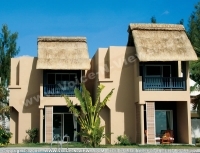 The thatch roofed main building, natural building materials and an interior decoration in warm colours attribute to the hotels friendly and exotic atmosphere. This small but cosy hotel is located in the north-northeast of Mauritius on an idyllic beach facing Coin de Mire Island. The Calodyne sur Mer offers a new concept of accommodation. On the west coast of Mauritius lies one of the best beaches of the island with turquoise waters, and colourful tropical fish. There, a little haven of Creole style bungalows awaits you. A small and charming Hotel, only 4 km from the lively village of Grand Bay with its variety of restaurants, bars and boutiques. The Klondike Hotel is built in traditional style and situated on the west coast of the island in a tropical garden. Upon entering this dynamic stylish hotel, you most probably think you did by mistake step on board of a cruise-liner and are about to leave port. The design of the Suffren hotel creates a modern version of a nautical ambience with a touch of comfort in a dreamlike atmosphere. 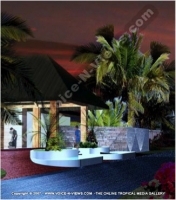 Imagine a resort between sea and mountain, situated in the midst of lush vegetation. This charming hotel pays tribute to the legendary young couple of the tragic love story by Bernardin de St. Pierre, based on historic events in 1744. 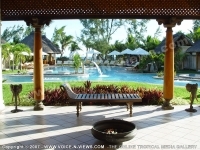 This 3 star hotel is located in the North West of Mauritius, right at the beach of Pointe aux Piments and exudes a true island holiday feeling. Newly concepted as a family hotel and reopened in November 2006. Le Suffren Hotel & Marina is ideally located next to the Caudan Waterfront. The exclusive shopping and business of Port Louis and its surroundings are all within easy reach. Trendily decorated with light wood and chrome, Le Suffren combines the unique charm of a nautical setting with modern comfort and quality service. Its 100 modern bedrooms, white sandy novel beach, trendy concept bar, avant-garde style restaurant and lively terrace on the marina appeal to those looking for a viby alternative. For those who wish to combine the pleasures of sunbathing with the joy of shopping and nightclubbing, the Veranda Grand Baie Hotel & Spa is the perfect choice. This excellent hotel is located on the southern end of Belle Mare on a wonderful white sandy beach, overlooking a fantastic lagoon protected by a colourful coral reef.